The university’s new Catholic Chaplain, Father Jordan Lenaghan, is working to support the Eastern Orthodox community at Quinnipiac. As part of this mission, Father Peter Orfanakos, a Greek Orthodox pastor from Orange, Conn., held a Vespers service on Thursday, Nov. 14. A Vespers is a prayer service done in the Eastern Orthodox Church at sunset to honor a different saint each day. 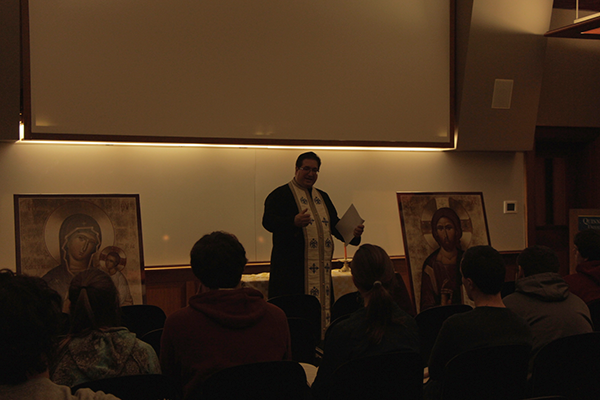 Eastern Orthodox students and members of the Catholic Student Association attended the Vespers service. “We just want to help out our fellow brothers and sisters of faith,” said senior Marina Dugan, public relations for the Catholic Student Association. Father Orfanakos was senior Evan Milas’ pastor growing up. Milas said he would enjoy having more Vespers services on campus. Father Orfanakos and Father Lenaghan hope to hold more services that both Catholic and Eastern Orthodox students can attend. “I think what you’re seeing tonight is the giant leap forward,” Father Orfanakos said. Father Orfanakos will speak at a faith and dialogue series on prayer in the Eastern traditions in the spring semester, Father Lenaghan said. Father Lenaghan also plans to reach out to the Hellenic Student Association, the Greek student group on campus which many Orthodox students are a part of, to find out their needs. “Catholic chaplaincy is providing the opportunity for Orthodox students to come to a deeper appreciation and understanding of their own religion by providing services and opportunities for them,” Father Lenaghan said. A stronger Eastern Orthodox presence on campus is something Orthodox students have been calling for, according to Father Orfanakos. “At the very practical level, there are Orthodox students at Quinnipiac and this is a way to meet their religious [needs],” Father Orfanakos said. About 1.5 percent of students identify as Eastern Orthodox, according to Father Lenaghan. “Part of the direction now as the Catholic chaplaincy is to become more open on campus and being able to facilitate meeting the needs of not just Catholic students, but all the Quinnipiac students,” Father Lenaghan said. Attending a Vespers service is important not just to Eastern Orthodox students, but to Catholic students as well, according to Father Lenaghan. This will show the diversity in the Quinnipiac community, Father Lenaghan said.